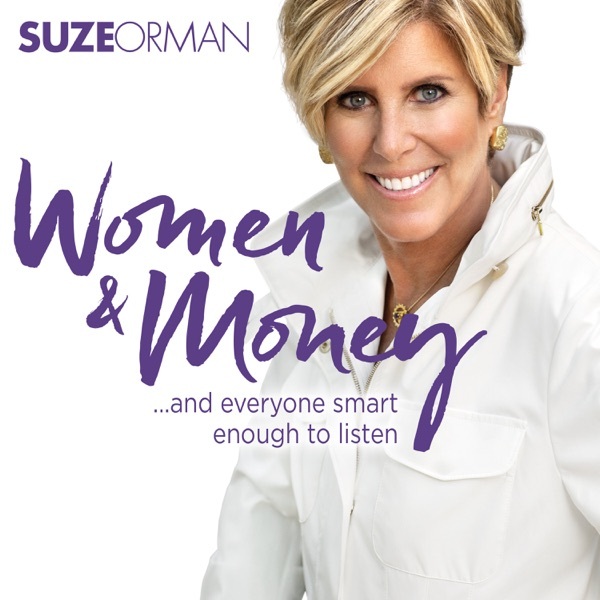 From America’s Matriarch of Money, Suze Orman’s Women & Money podcast speaks directly to every mother, daughter, grandmother, sister, and wife — and the men who are smart enough to tune in. Each week, Suze will empower listeners to own the power to control their destiny and offer the chance to tap into Suze’s unique spirit, people-first wisdom, and unparalleled appreciation that for women, money itself is not the end goal, it’s the means to living a full and meaningful life. Suze will share her personal stories and unmatched personal finance expertise to answer your questions and offer insightful and actionable advice. Through the Women & Money podcast, Suze will entertain, educate and empower — unlocking 35 years of experience in helping create wealth for millions and millions of people all over the world — she is your personal finance teacher. Do you have a question or topic you want Suze to cover on the podcast? Send her an email at asksuzepodcast@gmail.com. What do you think the six most valuable words in life are? How do they relate to Women and Money? On this episode, Suze shares a personal story about learning from particular life experiences. Reach out to AskSuzePodcast @gmail.com, remember during Ask Suze Anything episodes, Suze may pick your question to answer on the podcast. If you like the Women & Money theme song by Effie, you can get it here. On this special episode of Women and Money, we do what is called a “Cross-Pod” episode. Tim Sinclair, the CEO of Ringr, has a podcast called “Also Humans, ” and he interviewed Suze on a recent show. In this riveting conversation, you’ll hear how Suze started her career, pivoting from wanting to open a restaurant to becoming the world’s most influential money expert. Plus, you’ll learn who her soon to be famous, sort of roommate was in college! In this episode, Suze celebrates International Women’s Day. Listen for a powerful story about the need to stand up for and respect yourself. Remember, not only should you respect yourself, you should also stand up for and respect your money. Click here to watch the video of Aretha Franklin singing Tena Clark’s song “Stand Up For Yourself. This Episode of Ask Suze Anything is all about ROTH IRAs. You all asked great questions and Suze tells you everything you'll need to make the best choices in opening and funding your ROTH IRAs. You can still register to see Suze live at the Apollo Theater in New York City on March 16. Get tickets and details here. Hey Girlfriends - this is a MUST LISTEN to episode about the laws of money. And one you’ll want to have pen and paper ready to go. You’ve all heard about the laws of money — but in this episode you’ll get Suze’s top tips that you can use in any area of your life . . . especially when it comes to decisions about your money. Suze tells a funny story on how she learned to trust her gut as a financial advisor. What she did may or may not surprise you. But the reactions of the others most certainly will. Share your story with us after listening to the show. Reach out to AskSuzePodcast @gmail.com or call the Women and Money voice line at 1-877-545-SUZE (7893). Remember during Ask Suze episodes Suze may pick your question to answer on the podcast. In this “Ask Suze Anything Episode”, Suze responds to great questions from Patricia, Tammy, Logan, Jackie, Jill, Donna and Aidy. She covers student loans, personal loans, how to plan for retirement from the Military, inheritance, trusts and the importance of making the right estimates on your taxes if you are self employed. You can Ask Suze Anything by emailing AskSuzePodcast (at) gmail.com or call the Women and Money voice line at 1-877-545-SUZE (7893). What Does Self Worth and Twitter Have In Common? In this Episode, Suze reads a very moving story about a woman who was in an abusive relationship, and did not realize it. You'll hear how the use of Twitter was used for good and helped to free her. If you have questions after listening to the show , reach out at AskSuzePodcast (at) gmail.com or call the Women and Money voice line at 1-877-545-SUZE (7893). In this episode, Suze responds to your questions about her last episode. We’ll hear from listeners; Jaime, Tanya, Sissy and Brian. Get Suze’s Must Have Documents for a special price only for podcast listeners, visit www.suzeorman.com/offer. Protect yourself, your family and your assets, all while saving thousands of dollars in lawyer fees! This episode includes a special Valentine from Suze. You’ll hear a very personal story about why it’s important to do what’s right for you, so you can have the strength to help other people. In this episode, Suze tells a powerful and heartbreaking story of a women she met on vacation and how this woman lost everything as a result of financial abuse. In this episode Suze shares her personal feelings about her own investments. Suze then answers questions from our community, covering topics like; stock market volatility, how long should you wait out the market, converting to ROTH IRAs, what to do about a 401k balance that appears to be falling and so much more! On today’s podcast, Suze wants to have a conversation on the stock market. With the latest period of ups and downs the markets, Suze’s inbox has been full of questions asking for advice on when to know if you should stay in the market vs. when you should get out. In a classic Suze response, she reminds us that fear is one of the three biggest obstacles to wealth and offers critical advice to help you determine the right mix of investments regardless of whether the markets are behaving as they are right now. Suze goes further to explore the power of finding the combination of financial independence and financial freedom by answering listener questions. You can be part of the conversation by leaving a message at 1-877-545-SUZE (7893). While wahoo fishing a few weeks back, Suze had a revelation. What she realized is that financial freedom can no longer be the only goal. This week, Suze explores the power of finding the combination of financial independence and financial freedom. She invites you to join her in the FIFF movement on your way reaching the real goal of having money, and that is to be secure. For Part Two of Broke No More, Suze takes her signature straight forward approach to answering questions and unpacks the bag on what it takes to stop being broken and start getting right with yourself, so you can get right with your money. This is a special bonus episode especially for Federal Employees whose pay is effected by the governent shutdown. Suze explains how you can access money you may not know is available to you, so you can pay your bills until the government re-opens and pay resumes. This episode explores the true reasons you feel broke regardless of how much money you make. So if you feel broke all the time or you have felt broke in the past — this is the episode for you to kick-start your year and learn what it takes to stop feeling broke and start feeling secure. Season 2 of Suze Orman's Women and Money starts January 13. Listen to this special mini-episode to find out how you can be a part of the Podcast. Suze delves into a form of abuse that often goes unnoticed: financial abuse. She examines the possible signs to look out for and what actions you can take to keep your financial stability from falling into the wrong hands. Later, Suze gets a very intimate look into the life of financial abuse survivor Shaundre and her journey towards re-establishing her financial freedom. For more information on abuse or help with an abusive situation, contact The National Domestic Violence Hotline by visiting www.thehotline.comor calling 1-800-799-SAFE(7233) — they are available 24 hours a day, 7 days a week, 365 days a year. Suze talks about anger: one the major obstacles to wealth that has a tendency to sneak up on you. She takes a call with Jamie, a school teacher and single mother who makes good money, but now faces mounting bills, a lack of retirement savings and possible eviction from her home. Is the resentment and anger towards ex-husband keeping her from making good financial decisions? Suze lets it rip on what is aggravating her and it’s all about people making one of the biggest mistakes of all: not having their “Must Have” documents complete, and as Suze says “it's just stupid people!” This hard hitting episode teaches you everything you need to know about protecting you and your loved ones. Suze offers listeners deep insight on one of the greatest obstacles to creating wealth: fear. She explores the emotions of fear from every possible angle and shows how to create a new personal truth, so you can have power over your life and your money. Our caller this week, Janet, is terrified of being a burden on her son when she’s in retirement, while she also juggles the reality of caring for her own mother. Is she earning enough to retire comfortably? Does she have enough to support her aging mother? What changes can she make to her finances to ensure that her financial foundation is as strong as possible? In this episode, Suze spoke with Michelle, who fears she will never have the retirement of her dreams unless she starts investing now and starts building wealth. But, how to build wealth at 51? Is it too late to start investing? Suze says, "..absolutely not!" This episode is loaded with everything you need to know about investing from individual stocks to mutual funds and ETFs and so much more in order to grow your wealth. Get ready to take notes, because on this episode of Suze Orman's "Women & Money" podcast is dense: full of valuable information on how to live a life of wealth. But, what is true wealth? Suze defines it as internal riches not financial. She says when the eight qualities of harmony, balance, courage, generosity, happiness, cleanliness, beauty and wisdom are smoothly working together, the money will surely follow. The show has received many questions about retirement and how best to invest for your futures. So, here it is, many different questions asked and answered including a big warning about a mistake made far too often with retirement plans. On this episode of Suze Orman's "Women & Money" podcast, Suze and Sarah ask and answer the question: how critical is it to surround yourself with people that are responsible with money? Also, Suze speaks with Antoinette who is dating a man deep in debt with little income. She wants to know, should she stay or go? In this special episode of Women & Money, Suze chats with Stella & Dot CEO Jessica Herrin about her vision to help women create financial independence through entrepreneurship opportunities. Jessica and Suze dive into financial outcomes and the powerful communities of women that are created through these shared experiences. Our caller, Grace, offers a powerful story about finding connectivity within the Stella & Dot family and also shares her personal financial challenges. Grace opens up about everything from hidden expenses, to what she doesn’t share with her husband. You won’t want to miss the advice Suze gives Grace. In this Season 1 highlight, Suze talked to Margaret, a mother of a sixteen year old boy, who was getting a divorce. Margaret put down $160,000 for a down payment of a house she and her soon to be ex-husband own. How can Margaret go about getting back what belongs to her? Also on this episode, Suze answers the question: when it comes to your money, do your needs matter more than your child's? In this highlight from Season 1, Suze speaks with Laura, who took some bad advice from a financial advisor. Also, lots of great questions asked and answered about how to determine if your friend, family, colleague or financial advisor is giving you good advice about your money questions. On this episode, Suze spoke with Brenda, who has been married for 24 years. Brenda was seeking advice on how to speak to her husband about his spending priorities without losing her temper. Suze took the conversation to an unexpected place. Listen and learn Suze's tactics for speaking with your partner in a productive way. On the first Episode of Season 1, Suze Orman spoke to Jennifer, a mother of four, who, in total agreement with her husband, did not want to give money to her in-laws. Despite Jennerifer's convictions, the guilt is compelled her to give anyway. What did Suze advise? Listen and learn.